Great ideas for school lunches! 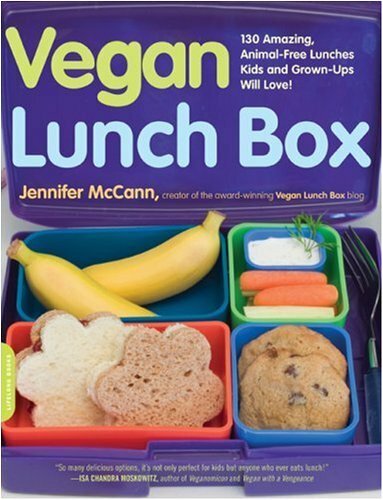 Vegan Lunch Box is packed with recipes, antidotes, and information on more than the vegan lunch box. Yes, it is primarily a cookbook for elementary school kids when prepared as the menus suggested--but it is so much more! To read it through is to learn how to become a vegan, or to incorporate more vegan dishes into you life. Jennifer McCann became a vegetarian at age 15 and ate the same thing for lunch for a year. She decided things would be different for her son. Every menu had to be graded a "5" by her son to be included in the book. McCann packs the lunches in a clever bento-like box, allowing for lots of choices and minimal environmental waste, as they are re-usable. Very clever. The lunches are sure to appeal to kids because they are colorful and fun. McCall is aware that kids notice other kids' food and takes pains to create meals that become the envy of fellow students. * Quick and easy menus. For example, one menu includes lunch nibbles--vegan deli slices and cheese with rice crackers. Disigned for the kid to assemble. Sample menu: veggie burger, sweet potato fries, wheat free apple crisp and Amazake to drink. * Rise and Shine menus. Includes menus from around the world. Part II is the recipes. While some of the recipes take a bit of time to prepare, many have multiple uses. McCall has smart suggestions like baking large batches of muffins and freezing them individually--perfect for the teen on the go. Highly recommend for all--vegan or not--for smart, fun and healthy lunches! From the author of Harmonious Environment: Beautify, Detoxify and Energize Your Life, Your Home and Your Planet. Great recipes, not enough pictures. I just bought this book yesterday at B&N - I can't believe how cheap it is on Amazon...I paid full price minus my 10% cardholder discount - still more expensive than Amazon. This is one of my favorite cookbooks. Great for lunches and much more! This was my first vegan cookbook, and I adore it. Although I actually don't have kids. The Ethiopian dishes are amazingly delicious, and it's worth buying the book for those recipes alone. I've used them successfully to impress company. There are a ton of recipes in this book that have become regular favorites, like the easy hummus, sweet potato fries, and cheezy roasted chickpeas.